Discover a sparkling collection of diamond hoop earrings. Explore our range of channel set diamond earrings from the Raphael Collection of earrings, each design precision set with diamonds. 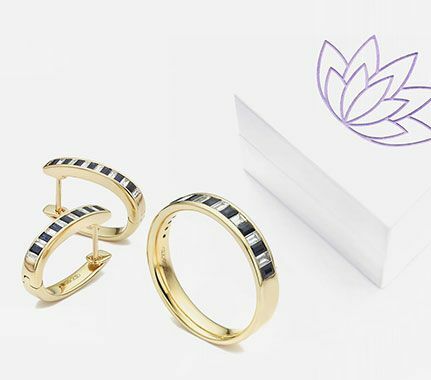 Each pair of hoop earrings are meticulously crafted to order and delivered beautifully presented with Worldwide delivery available to many countries. A Pair of Diamond Hoop Earrings channel set with a matching set of Baguette Cut diamonds Channel design. Hoop earrings. Baguette diamonds. Precision setting. 0.70cts diamonds. F/G colour VS clarity. 26 x baguettes. Available in 18ct Yellow Gold, 18ct White Gold, 950 Platinum and 950 Palladium. Wood boxed. Gift packaged. 3 weeks for delivery. Diamond hoop earrings channel set with a matching set of Baguette Cut diamonds. Hoop design. Channel setting. Baguette cut diamonds. 0.55cts total weight. 14 x 0.03cts baguettes. F/G colour VS clarity. Available in 18ct Yellow Gold, 18ct White Gold, 950 Platinum and 950 Palladium. Wood boxed. Gift packaged. 3 weeks for delivery. A Pair of Round Brilliant cut diamond hooped earrings. Round brilliant diamonds Hoop earring design, Channel setting, 0.76cts diamonds. F/G colour VS clarity, 16 x 0.04cts diamonds. Available in 18ct Yellow Gold, 18ct White Gold, 950 Platinum and 950 Palladium. Wood boxed. Gift packaged. 3 weeks for delivery. Channel set diamond earrings in hoop design set with round brilliant cut diamonds. Channel setting. Hoop design. Round brilliant diamonds. 0.55cts diamond weight. 16 x 0.03cts diamonds. F/G colour VS clarity. Available in 18ct Yellow Gold, 18ct White Gold, 950 Platinum and 950 Palladium. Wood boxed. Gift packaged. 3 weeks for delivery. A pair of princess diamond hoop earrings, with a double row of an invisible set diamonds. Hoop design. Princess diamonds. Channel design. Double row of diamonds with Invisible setting between. 1ct diamond weight. 48 x 0.02cts diamonds. F/G colour VS clarity. Precision setting. Available in 18ct Yellow Gold, 18ct White Gold, 950 Platinum and 950 Palladium. Wood boxed. Gift packaged. 3 weeks for delivery. A Pair of Channel set diamond hoop earrings set with Princess cut diamonds. Channel set design. Princess cut diamonds. 1.50cts total weight. Precision setting. F/G colour VS clarity. 16 x 0.09cts diamonds. Available in 18ct Yellow Gold, 18ct White Gold, 950 Platinum and 950 Palladium. Wood boxed. Gift packaged. 3 weeks for delivery..
Invisibly set Princess cut diamonds into a pair of channel set hoop earrings Princess cut diamonds. Channel setting. 1.00cts total weight. 16 x 0.06cts. F/G colour VS clarity. Precision setting. Available in 18ct Yellow Gold, 18ct White Gold, 950 Platinum and 950 Palladium. Wood boxed. Gift packaged. 3 weeks for delivery. A Channel set hooped earrings channel set with a matching set of Princess cut diamonds. Channel setting. Princess cut diamonds. 16 x 0.03cts stones. F colour VS1 clarity. 0.50cts total. Available in 18ct Yellow Gold, 18ct White Gold, 950 Platinum and 950 Palladium. Wood boxed. Gift packaged. 3 weeks for delivery. A Pair of Diamond set hoop earrings featuring baguette and round brilliant cut diamonds. Hoop design. Round diamonds. Baguette diamonds. 0.55cts total weight. 12 x baguette diamonds. 10 x round diamonds. Precision set. Available in 18ct Yellow Gold, 18ct White Gold, 950 Platinum and 950 Palladium. Wood boxed. Gift packaged. 3 weeks for delivery. A Pair of diamond hooped earrings with both Baguette cut & Princess cut diamonds invisibly set with in the precision cut channel. Channel setting. Hoop design. Invisible setting. Princess diamonds. Baguette diamonds. 1.35cts diamonds. F/G colour VS clarity. Available in 18ct Yellow Gold, 18ct White Gold, 950 Platinum and 950 Palladium. Wood boxed. Gift packaged. 3 weeks for delivery. Channel Set Diamond Hoop earrings with an alternating pattern of Baguette and Princess Cut diamonds. Channel setting. Princess diamonds. Baguette diamonds. 1.10cts total weight. F/G colour VS clarity. Available in 18ct Yellow Gold, 18ct White Gold, 950 Platinum and 950 Palladium. Wood boxed. Gift packaged. 3 weeks for delivery. Gift packaged. 3 weeks delivery. Diamond Hoop Earrings - Princess cut & Baguette cut diamond hoop earrings. Channel setting. Princess diamonds. Baguette diamonds. Precision setting. 1.00cts total weight. F/G colour VS clarity. Invisible setting. Available in 18ct Yellow Gold, 18ct White Gold, 950 Platinum and 950 Palladium. Wood boxed. Gift packaged. 3 weeks for delivery. A pair of hooped earrings channel set with both Baguette Cut and Princess Cut Diamonds. Channel setting. Baguette diamonds. Princess diamonds. 0.75cts total weight. F colour VS1 clarity. 12 x baguette diamonds. 10 x round diamonds. Available in 18ct Yellow Gold, 18ct White Gold, 950 Platinum and 950 Palladium. Wood boxed. Gift packaged. 3 weeks for delivery. Amongst the finest diamond hoop earrings available in the world, the iconic Raphael Collection of hoop designs are now available from Serendipity Diamonds. We have selected several styles of hoop styled earrings, from the collection, including baguette hoop styles, nestled alongside channel set earrings holding Princess cuts, for the optimum delivery of sparkle from the ear. This style wraps around the lobe of the ear, rather than sitting purely at the front and adjoins by clasp behind the ear in a simple, elegant and well thought out design that offers flexibility by way of diamond set earrings for the day and for the opulence of a special evening out. Diamond cuts such as the baguette, offer a more subtle show, whilst the round brilliant designs ensure maximum brilliance from mastered proportions of cut. Whether you are looking at your first purchase and require the expertise to advise, or you are surfing online, to discreetly gather guidance on diamond earrings, we will hopefully have the products and knowledge to guide you to an ideal choice.